Chandler Pink Pomelos have a refreshingly sweet and mildly tart flavor. 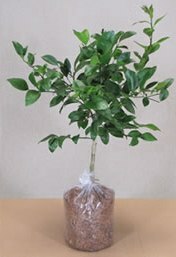 Their rosy pink interior, extraordinary texture and their incredible fragrance make them a delicious eating citrus fruit. Pomelos are a perfect addition to breakfast, salads, or use pomelos to create an exotic entree or desert. So, exactly what are Pomelos? They are very ancient ancestors to the common grapefruit (discovered in Southeast Asia about 100-200 B.C.) and is the largest fruit in the citrus family. They posses very little to no bitterness of common grapefruit you find in a grocery store. As a tree, they have larger deep green leaves than orange trees and have larger, very fragrant blooms in the spring and produces ripe fruit that hold well on the tree for months. Requires minimal pruning.